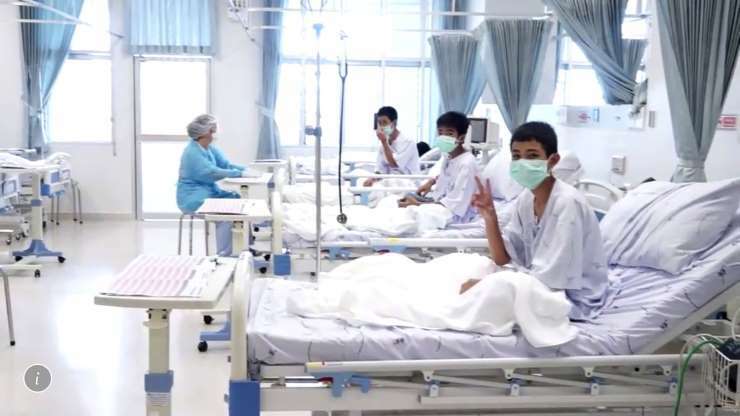 [post_ads]The boys, rescued in three groups from the Tham Luang Nang Non caves in northern Thailand, were in good health mentally and physically, according to doctors, with only one showing signs of a lung infection. They had lost weight -- an average of 4 1/2 pounds each -- but were hungry and largely unharmed from their ordeal. Some parents wept as they gazed excitedly at their children through a window looking onto the hospital, some waving. All wore yellow shirts in celebration of the birth month of Thailand's King Rama X. Some families were allowed in the ward, although they had to remain six feet from the boys and no hugging was allowed, doctors said. The boys, ages 11 to 16, and their 25-year-old coach, Ekapol Chantawong, were fitted with diving suits and face masks before being ferried from the cavern by divers. "They just stayed still and breathed as they were being carried out," he said. The youths were sedated to keep them calm and placed on stretchers when they emerged from the water into Chamber 3, the site of the underground command center where the stretchers were passed from hand to hand along a line of more than 100 rescuers. He said some actually fell asleep while on the stretchers. In a dramatic twist, a water pump failed just hours after the rescue operation ended and just as heavy monsoon-driven rains closed in, underscoring the precarious and time-sensitive nature of the operation. Youkongkaew said the scene was reminiscent of a movie. "But this one has a happy ending," he added. Narongsak Osatanakorn, who headed the rescue operation and came to be seen as a hero by some, did not lay blame for the boys' misadventure or for the costly international rescue effort. "Some say they are heroes and some say they are villains. In our eyes, we only see them as kids who just wanted to have some fun and then an accident happened," he said. "Personally, I wholeheartedly believe that they will grow up to be good citizens, because everybody knows them now and everybody will expect them to be." "I always believed they were alive," he said. The rescue operation involved 922 police officers, 10 helicopters and seven ambulances, officials said. Ninety seven foreigners, including expert cave divers, engineers, rescue experts and military personnel took part. At times, the boys were harnessed to ropes and drawn across steep caverns to spare them from climbing up and down jagged crevices and were floated across pools of water in other chambers. In one flooded tunnel, the boys had to be submerged to get through the passage, rescue specialist Derek Anderson told the Associated Press. Before the operation began, rescuers practiced the techniques with children in a local swimming pool, he said. Three of the boys and their coach are ethnic minorities and stateless, having fled from Myanmar to Thailand, where such immigrants often face poverty and discrimination. Asked if some would be granted Thai citizenship, Osatanakorn answered briefly: "It will proceed according to the law. If they are eligible under the law, then they will be given Thai citizenship." He said the Tham Luang Nang Non cave system, with its gaping entrance lined by stalactites, will be turned into a museum. "It will attract tourists from around the world to Mae Sai and will be a learning center for children and also divers around the world." He said Thailand would also create a database drawn from the experience that could be used if there's a similar crisis in the future. After a happy ending that captivated the world, rescuers and volunteers began leaving the site, including Thawatchai Fuengkachorn, who led a pumping team with four gigantic "Naga" pumps normally used in the shrimp farming industry, according to local media outlet Khaosod English. The pump company volunteered its services for 12 days, working 24 hours a day without demanding payment. Also departing was Dr. Richard Harris, a cave-diving and rescue expert from Australia who swam to the caves daily during the rescue, checking the condition of the boys and the coach before finally clearing them to be extracted from the cave. But it was the boys and their coach, not medical experts, who decided what order the boys should leave the cave, according to officials. 10:50 a.m.: This article was updated with Los Angeles Times staff reports. This article was originally published at 7:40 a.m .